Following is a slightly modified version of the introductory chapter of my MA thesis (Earlham School of Religion, 1999). As time and my ability to handle Greek and Hebrew fonts permit, I plan to post the rest of the thesis here as well. After several years of carrying questions and answers back and forth between the texts, it has begun to dawn on me that Fox was not merely "using" the Bible, quoting from it or alluding to it as a way of explaining or supporting his position. George Fox was actually living the Bible, and apparently succeeding in communicating why and how others might also do so. 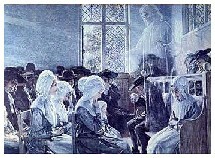 Unlike the Puritans and most other Christians, who believed they needed the Holy Spirit in order to properly interpret Scripture, Fox and his followers believed that they were themselves continuing the story that Scripture told, becoming apostles and prophets, and so continuing to bring Scripture to fulfillment. As I began to study the letters of Paul3, I expected to find in Fox many quotations, allusions, and "echoes" of the Pauline material - what I now know as "intertextuality" - and these were certainly present. However, in addition, I found George Fox speaking, writing, and behaving as if he thought of himself as a Paul-like figure: one who had received direct revelation from God, and a mission to preach the gospel to the seventeenth-century counterparts to Paul's Jews and Gentiles. I came to see that Fox was following Paul in appropriating the biblical "offices" of prophet and apostle. As Fox re-enacted the role of Paul, so Paul himself was re-enacting the roles of prophet and apostle; indeed this replaying is key to Friends' understanding of right use of Scripture: a living hermeneutic. Reflecting on writings by and about Paul and Fox has been catalytic in, and synergistic with, my becoming a follower of Jesus. I have gone from being a fascinated outsider to an active participant as a member of the body of Christ, breathing the Spirit and experiencing the biblical stories first-hand: quite a remarkable statement for an educated child of postmodernism, unchurched for over 25 years, and not particularly looking for conversion! This study reflects my experience of the value, for biblically illiterate liberal Friends, of learning to read with Fox in one hand and the Bible in the other. Most of the time we do this starting with Fox, and quickly become frustrated because we lack the knowledge or tools to understand his biblical idiom. I suggest that we should also start with scripture, immersing ourselves in a smaller or larger portion and then looking for ways that Fox lived into it. Ideally, in order to understand Fox, we should follow Fox's own process: reading, pondering, struggling with Scripture as a whole and in all its parts, turning only to the Light of Christ for guidance.4 Fox evidently read and internalized the Bible and then, in dramatic moments he called "great openings," meaning became manifest to him. One might even say he "incorporated" or "incarnated" the text, in the sense of making it part of himself or embodying it. In this study I illustrate a way of using scripture and Fox in mutual interpretation, using a part of the third story of Paul's "Damascus road" experience (Acts 26) as my starting point. Along the way I use many of the tools of modern biblical criticism, but I also attempt to keep Fox's view of scripture in sight. It is my hope that this study will in some way help me and my faith community to live into the experience Fox and Paul so dramatically described, of hearing the Lord speak, turning to the Light of Christ, and accepting the Lord's call to ministry. I am grateful to the faculty and students of Earlham School of Religion and Bethany Theological Seminary who have helped me learn to hear the word of the Lord through Scripture and early Friends, particularly New Testament professors Dan Ulrich and Rick Gardner and Quaker Studies professor John Punshon. 1. Richard B. Hays, "On the Rebound: A Response to Critiques of Echoes of Scripture in the Letters of Paul" in Paul and the Scriptures of Israel, ed. Craig A. Evans and James A. Sanders, Journal for the Study of the Old Testament Supplement Series 83 (Sheffield: Sheffield Academic Press, 1993), 72. 2. John Hollander, The Figure of Echo: A Mode of Allusion in Milton and After (Berkeley: University of California Press, 1981), 65-66. 3. Following George Fox, I use the name "Paul" to refer to the character in the book of Acts who is earlier referred to as Saul and later as Paul, as well as the person traditionally believed to be the author of the books of Romans, Corinthians, Galatians, Ephesians, Philippians, Colossians, Thessalonians, Timothy, Titus, and Philemon. Where a distinction needs to be made between this traditional character-author and the views of modern scholarship, I do so explicitly, but my bias is toward trying to read as Fox did. I refer to the implied author of the Gospel of Luke and of the Acts of the Apostles as "Luke," which usage conforms to the views of the canon itself, modern scholarship, and Fox. 4. Nevertheless, a way to start is necessary. Online texts and search tools ease the way for finding places where Fox and other early Friends cited particular biblical texts, and places where Fox used particular biblical terms and their variants. Another helpful tool I found early on was the Strong's Concordance numbering system, and interlinear Hebrew and Greek Bibles keyed to these most useful numbers. For some reason, even the most biblically illiterate liberal Friends, when we pick up the Bible, want to know what the Greek or Hebrew "really" says, and what that "really" means. We want answers to all the historical critical questions so important to modern and postmodern readers. We're not capable of accepting the English-language text as given in the way that Fox was: we want to know if he got it "right" according to our modern and post-modern sense of what "right" means. Even though I'm now able to make use of much more sophisticated methodologies and reference materials for investigating the meaning of biblical texts, I still often use Strong's. 5. Michael Fishbane, The Garments of Torah (Bloomington: Indiana University Press, 1989), 16. 6. Rolf Rendtorff, "Canonical Interpretation: A New Approach to Biblical Texts," Pro Ecclesia III, no 2 (1994): 147, 146.